Mexican Wedding cookies are a favorite buttery pecan shortbread cookie recipe that is known by many names. I call them Mexican Wedding Cookies but you may know them by Italian Wedding Cookies, Russian Tea Cakes, Snowball Cookies or Mexican Wedding Cakes. They are one of our favorite Christmas cookies to bake and eat. I first shared this favorite Christmas cookie recipe back in 2011. 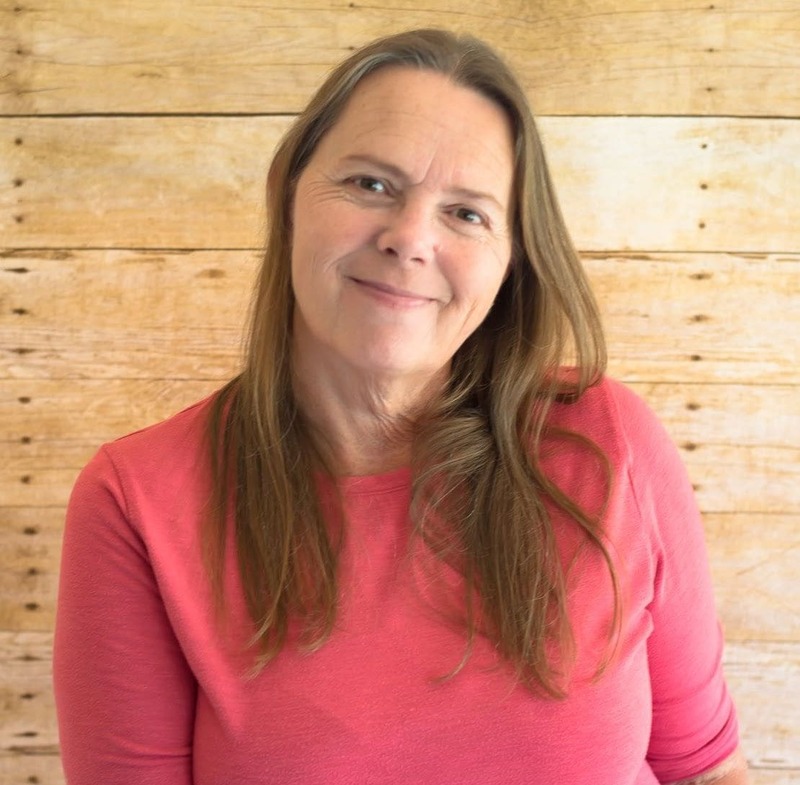 While I was baking the Mexican Wedding Cookies for my Christmas Cookie exchange I decided to re-shoot the photos and share it again. 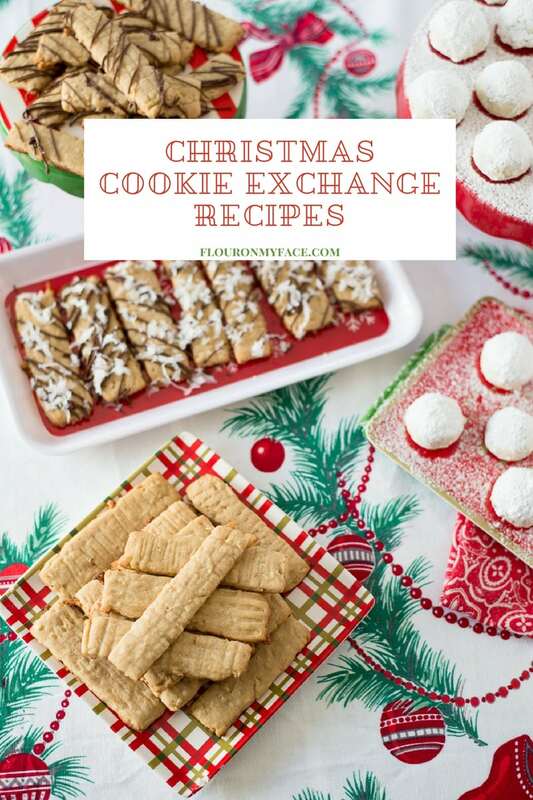 This is a great Christmas Cookie Exchange recipe that everyone loves. Mexican Wedding Cookies are sweet and delicious. The easy holiday cookie recipe for a cookie exchange calls for 5 simple ingredients that when combined create a buttery shortbread cookie that melts in your mouth. Chopped pecans give it a little crunch and the powdered sugar coating makes a Mexican Wedding Cookie look just like a mini snowball adds just the right amount of sweetness. 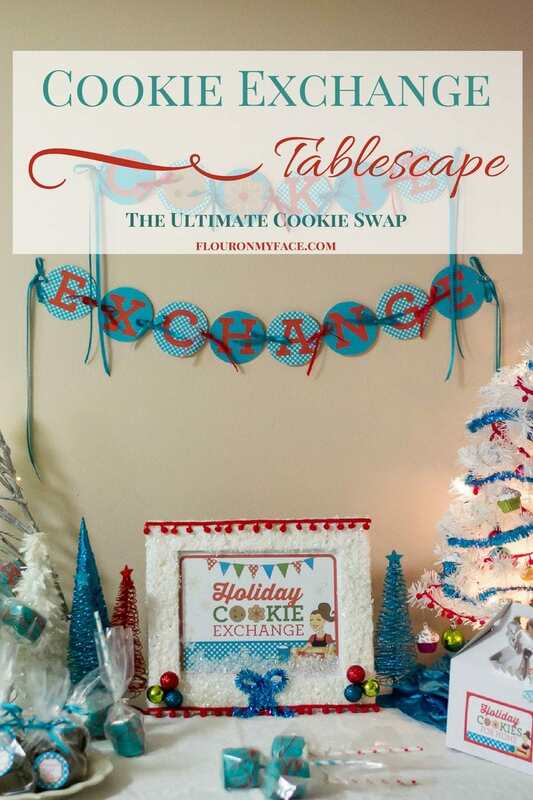 Planning to host or invited to a Christmas Cookie Exchange? You might like to check out some of my other Christmas cookies for your cookie exchange. Old Fashioned Coconut Washboard Cookies: This vintage Washboard cookie recipe is a new one I made last year for the first time. I love how easy it is to make three kinds of cookies from one cookie recipe. Cherry Blossom Cookies: Cherry Blossom Cookies are my favorite Christmas Cookie Exchange recipe and I make them every Christmas and have been for many years. Raspberry Thumbprint Cookies: These Raspberry Thumbprint Cookies are a very easy cookie exchange cookie recipe because they are made with an envelope of sugar cookie mix. Big Soft Ginger Cookies: Soft Ginger Cookies are a traditional Christmas cookie recipe that has been around forever. These ginger cookies make a great ginger cookie crust for a holiday cheesecake. 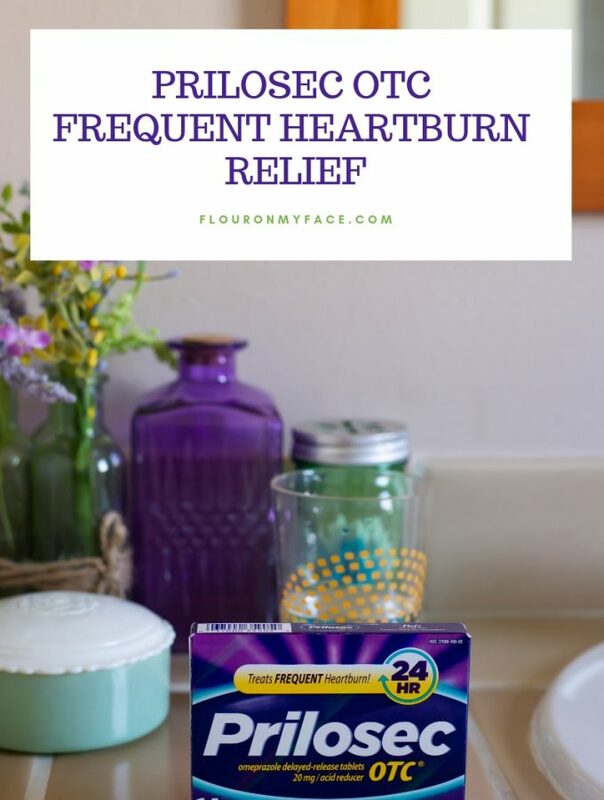 Beat the butter and 1/2 cup of the powdered sugar in a (affiliate links) kitchen-aid mixer or a bowl with a handheld mixer until light and fluffy- about 5 minutes. 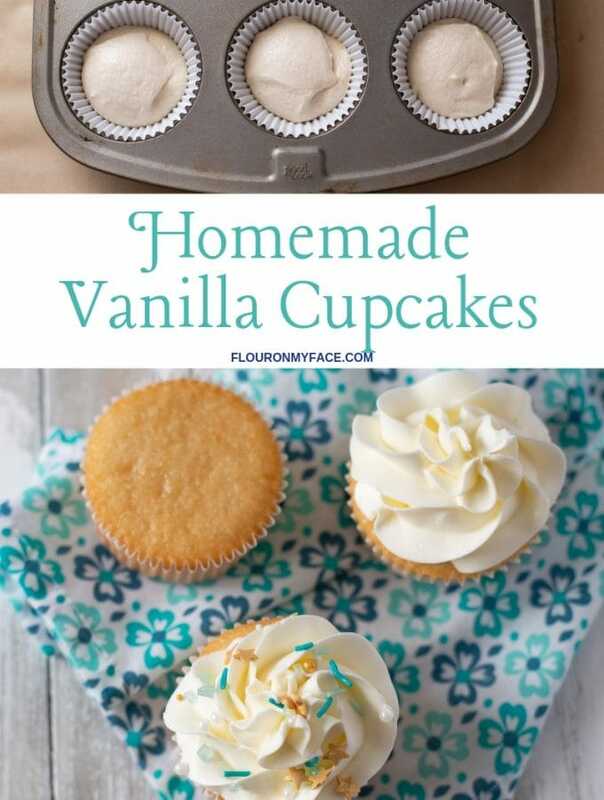 Add vanilla extract and beat until vanilla is completely incorporated. Slowly begin to add the flour to the bowl 1 cup at a time. Mixing with your mixer until the dough becomes too much for your mixer to handle. Added the remaining flour and the finely chopped pecans and mix well with a wooden spoon. Continue mixing until the pecans are evenly distributed through out the dough. Shape the dough into one and half inch balls and place on a cookie sheet that has been lined with parchment paper leaving 2 inches between the cookies. Remove the cookie sheet from the oven and cool for 5 minutes. Drop each cookie one at a time into a mixing bowl with the remaining 1/2 cup of powdered sugar and roll the warm cookies in a bowl thickly coating all sides. Place sugar dipped cookies on a cooling rack and cool completely. Store in single layers in an air tight container. 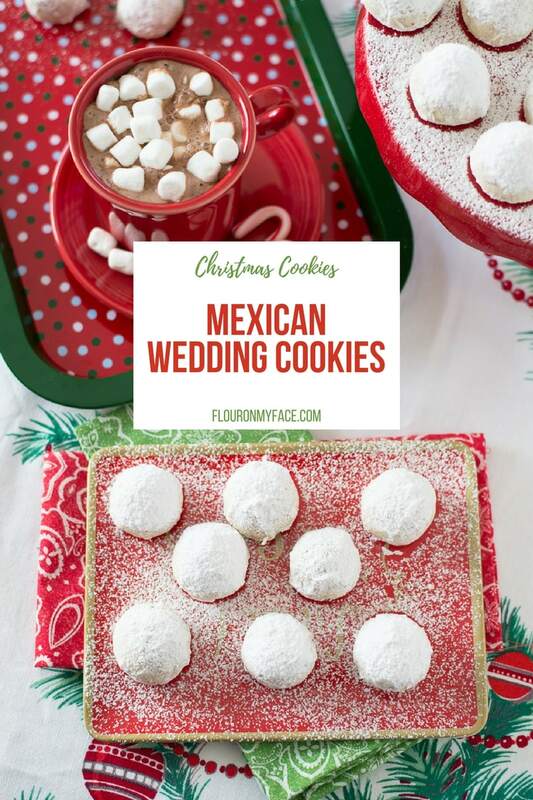 Sweet and delicate authentic Mexican Wedding Cookies recipe is a great Christmas Cookie Exchange recipe everyone will love. 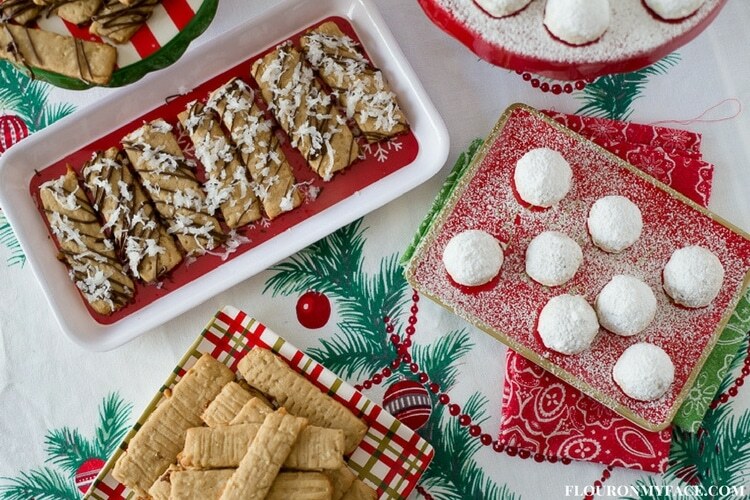 Hosting a Cookie Exchange this year? 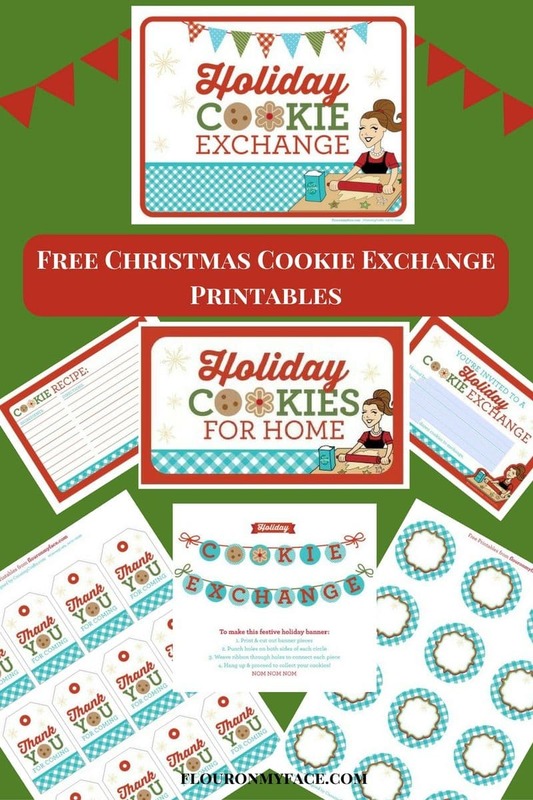 Grab the free Cookie Exchange Printables pack. 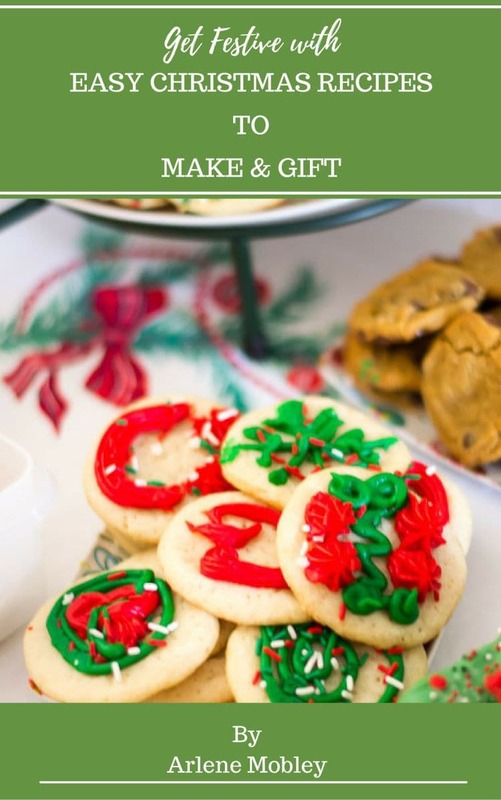 Buy the Get Festive Easy Christmas Recipes to Make and Gift eBook for $1.99 limited time offer! Sorry you’re having a problem printing the recipe. I just printed it myself and all of the words are printing correctly. It may be an issue with your browser. 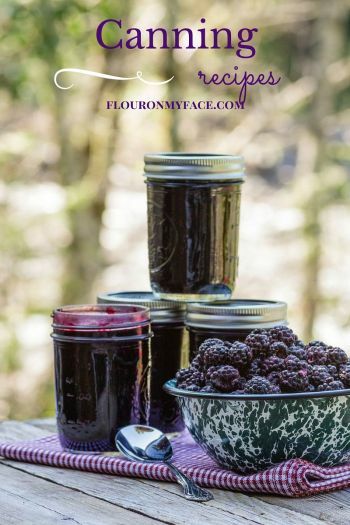 If you copy and paste the recipe into a text editor you should be able to print the recipe as it appears on my website. 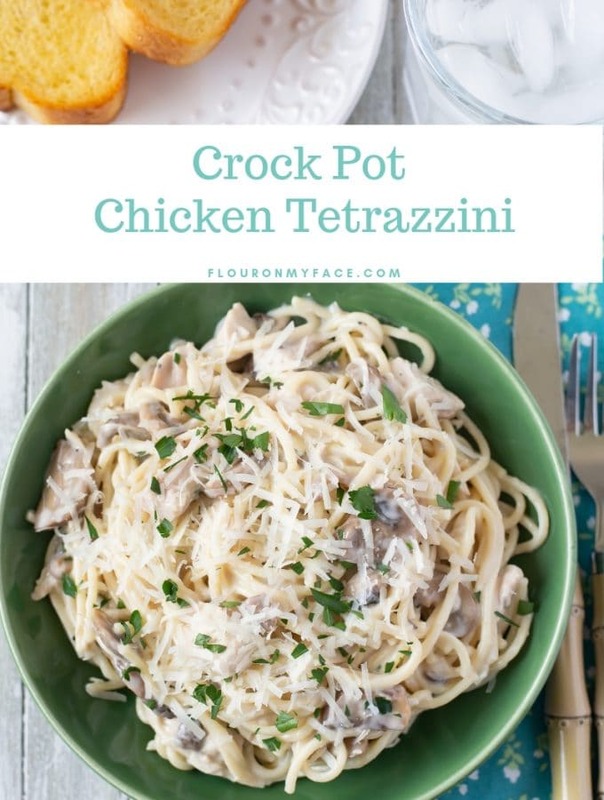 Enjoy the recipe and Happy Holidays! I am a shortbread lover. Christmas would not be the same without them. 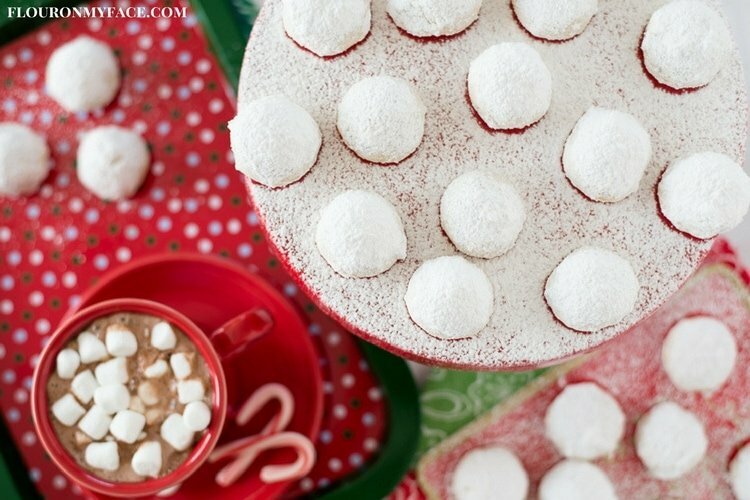 These cookies look like delicious snowballs, and would make a great addition to any holiday tray of goodies. These look like Christmas! Little snowballs of deliciousness. And I love how simple and straightforward they are to do. Can’t wait to try them. They make the perfect Christmas cookies! Arlene, please help this old Papa out. You mention cooking but no where have I found at what temperature. Papa G the cookies are baked at 375 F. for 11-14 minutes or just until they start to get golden around the edges. I just learned something new — Mexican Wedding Cakes are considered a shortbread cookie. For years I’ve said that I’ve never made shortbread cookies. Well, I guess it’s not true! 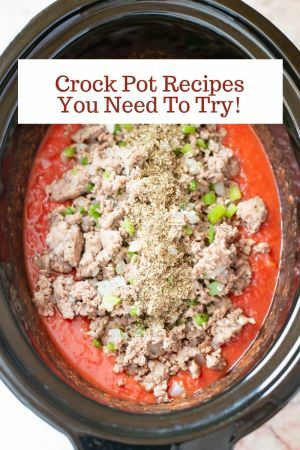 I’ve been making these balls of goodness for years. It wouldn’t be a Christmas Cookies Tray without them. Ah Marisa shortbread cookies are so much easier than most people think. Just a fancy name for a cookie with a high butter ratio. They are also known as butter cookies. These are my favorite cookies….I didn’t know what they were called and I just discovered them a few years ago. I didn’t realize they only require 5 ingredients. My cookie exchange is tonight and I wish I had seen this earlier! Looks delicious! These are the best Christmas Cookie Exchange cookie recipe! We have a very similar cookie in India and we call it Nankatia – but with almond meal instead of pecans. The Pecan sounds so delicious. I love how pretty these look like snow balls. Perfect name..